Our lazy Sunday mornings consist of making a large breakfast and enjoy it together over leisure conversation while blocking out the rest of the world. No TV, no newspaper, just the company of each other and our puppy. It’s been a tradition since I was young and I remember waking up on the weekend to the smell of breakfast being made with my Dad asking from the kitchen how I would like my eggs. Well the food has changed but not the tradition of sitting down and enjoying the time together. Just like my Dad, my favorite meal of the day is breakfast so I am constantly looking for ways of making my classic Sunday breakfasts’ healthier. 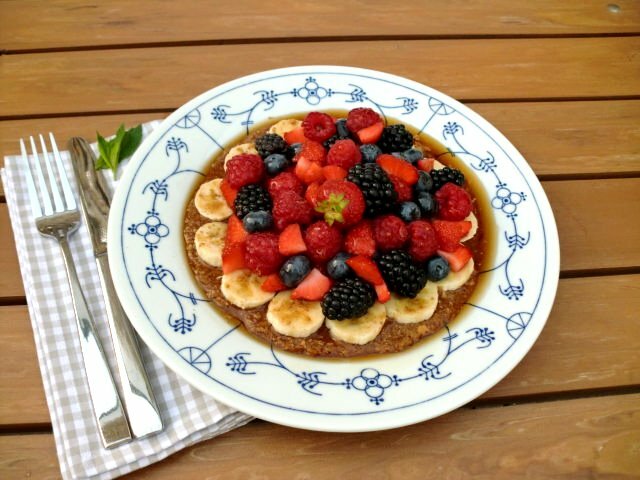 One of my best-loved Sunday morning options are these scrumptious Cinnamon Pancakes, warm tasting, sweet and overflowing with fruit. Selene at Veganlicious had the genius idea of adding bananas as the binding agent and I had to make my own version! Thanks Selene for the inspiration! Serve these Cinnamon Pancakes with Lavender Honey or warm Maple Syrup! Grind the flax using the flat blade in a Magic Bullet, personal blender or grinder until a meal forms. Empty into a medium size bowl. Blend the rest of the ingredients and empty into the bowl with the flax meal. Lightly fold the mixture together and let sit for 5 minutes while you prepare the Fruit Topping. This will allow the flax meal to become thicker. Slice the bananas lengthwise about 1/4 inch thick. Wash the berries and dry with a paper towel. To assemble, divide the sticky, thick Cinnamon Pancake batter in half over two large plates. Using a spatula smooth out the surface into a round circular pancake form. Top with the banana slices and sprinkle with cinnamon and nutmeg. Top with the mixed berries and drizzle with Maple Syrup, Honey or Agave Nectar. This entry was posted on July 31, 2010 by Olive. It was filed under Uncategorized . Pancakes look great! Thanks for the recipe. I’ll give them a try. Wow, these look amazing and so easy! I need to try these out! Thanks! This looks so good I want to eat it right now! Unfortunately, I am @ work, so no Sunday breakfast for me…especially not something so healthy and beautiful at the same time. As life would have it though, with all it’s twists and turns, I did make this for your Dad in your place on Father’s Day and he loved it! Keep up the good work Carla! So delish and fresh looking! Yum! I just want to send a note to say this is my first very successful raw recipe. Just found your blog through Lauren ; ) These pancakes look great! My oh my. I first saw this a few weeks back. Liked it, but just never got around to making the darned thing. Then I got my weekly email form Chris Karr. And was her recipe of the week. I believe in Karma, so there was no possible way I was not supposed to make this dish. And I did…this morning. I am just blown away at the simplicity of this dish. Some folks may have some issues with the texture, but I did not. To each his own. The taste was incredible and if I am the only one to eat this dish, then so be it. None to share. Mauahahahaah! They were super easy to make and super delicious to eat!